It’s that time of year when everyone wishes they were a ginger, with a last name like Flannigan, which would make the number of pints of Guinness they're about to consume slightly more forgivable. When it comes to celebrating Emerald Isle-style, you can't do better than these 10 spots. Note: we skipped chains like Fadó in order to celebrate the little guy [insert leprechaun joke here]. Kelly’s boldly set up shop right next door to The Dubliner. Think of it as The Dub’s tipsier, divier, sweatier, more unpredictable frat brother. What it does best is pay tribute to police and other first responders, not only during National Police Week, but also with a wall of patches behind the bar. Order some cheap pints and the pork slap sandwich, but stay out of the dungeon of bad choices (unless, of course, you’re looking to mash faces with your roommate). You better believe the pours of Guinness are perfect at The Dubliner. The folks behind this family-owned pub have had some serious practice (this incarnation of the bar has been open since 1974). And don’t be surprised if the person taking your order has an authentic Irish accent -- many staff members are from the Emerald Isle. 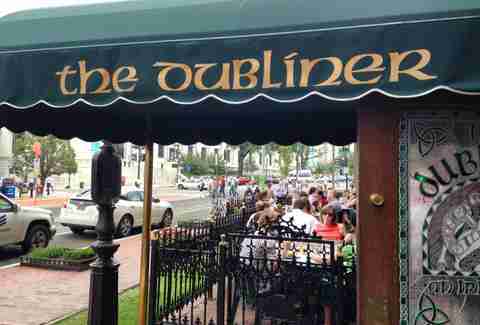 Furthermore, the pub is a bit of a maker of men -- alumni of The Dubliner have gone on to open 35 pubs so far. Make the most of a visit by ordering the Guinness Burger: ground sirloin marinated in the dark beer before being served on top of a potato pancake with Welsh cheese sauce and onion straws. 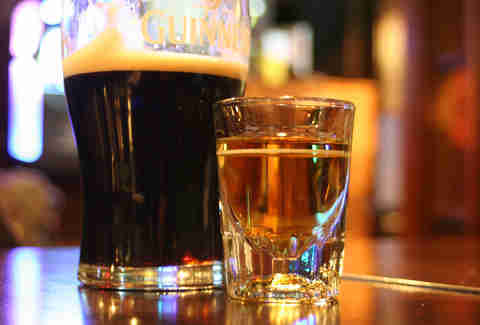 Of course, a dram or two of Irish whiskey will help you digest it. The list of Irish whiskey here is 50 lines deep. You damn well better be sipping yours neat from a Glencairn glass -- especially if you’re trying a rare find like Bushmills Millennium -- unless you decide that your last name is O’Tool and you require rocks. IWPH is spread out over three floors, each with a distinct personality. Owner Reese Gardner toured Ireland to get a feel for Irish pubs before opening the bar. That’s why you won’t find any pot-of-gold posters on the wall -- just a lovely, cozy place to consume bangers & mash. This Jewish-Irish mash-up pub packs some serious chutzpah: the concept is Irish pub-meets-Jewish deli, and it's a great one. You’ll find both Guinness dry stout and Shmaltz Hop Manna IPA on tap, as well as a standout Irish whiskey list, and clever cocktails featuring Jameson infusions. 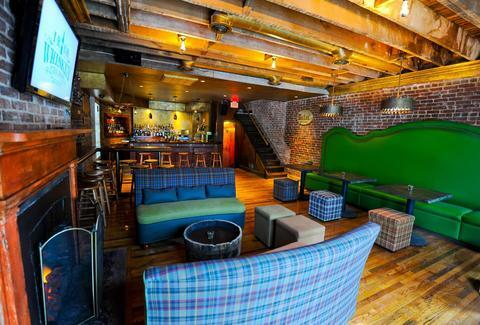 Settle onto a stool at the custom-designed bar with traditional Irish knotting, and gaze at Irish flags next to bar mitzvah photos. One of the best times to visit -- besides St. Paddy’s Day, when the bar opens at 8am -- is for its regular Thursday night bingo. It wasn’t always called Nanny O’Brien’s, but there’s been an Irish pub at 3319 Connecticut Ave for more than 40 years. "That’s where my grandfather lived," you might hear a patron say as he points to an old Irish street sign on the wall. Also adding character is a portrait of JFK and a Riverdance poster signed by the whole cast when they came in post-performance, according to general manager Michael Johnstone. It says a lot that those high-steppers picked Nanny O’Brien’s for the afterparty! Don’t leave without ordering the Harp-soaked hot dogs (with chili). They taste far better than they sound or look. 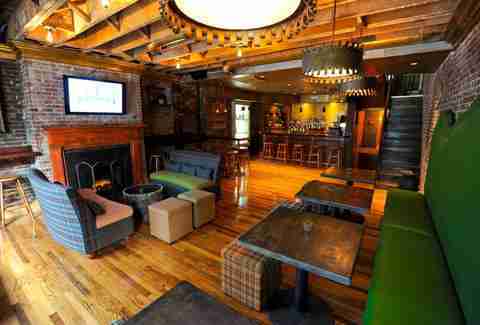 Blaguard sees being an Irish pub and a reliable neighborhood hangout as one and the same. That’s why local sports are on the TV, employees live a few blocks away, and "regulars" form the majority of the clientele (much as they would in Ireland). Part of the bar is even made from 100-year-old steel pulled from old streetcar tracks directly in front of the building. 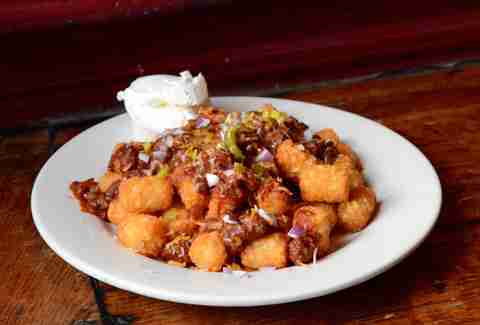 The 20 draft lines definitely include Guinness, and the chili-topped "Totchos" are legendary. Visit on St. Paddy’s Day, when everything Irish will be priced at $6. It’s not unusual for soccer fans to pour into Ireland’s Four Courts at 7am on Saturdays to catch a game. 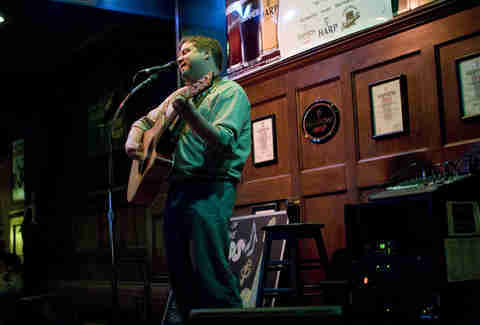 Nor is it strange to discover new music talent during Tuesday open mic nights. These are just two examples of how Ireland’s Four Courts brings people together with Irish hospitality. Yet another: you can purchase a personalized mug to use every time you visit, and any drink that goes into your mug is a little bit cheaper. The mug club is growing in popularity; general manager Dave Cahill says he used to sell five or six a week, but is now selling 12-15. 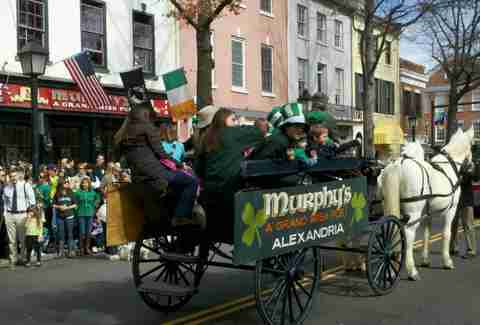 Music is at the heart of this Old Town Alexandria standby that’s been around since 1978. There’s hardly a night that goes by without live tunes. Order the Irish egg rolls stuffed with house-made corned beef, cabbage, and potatoes. Then order them again. A March visit is in order if you want to appreciate the heat coming off the fireplace, or if you'd prefer to enjoy the upstairs area sans impassioned Patriots fans. Immediately get over your hang-ups about this place being inside a Fairfield Inn & Suites, because the Irish Channel brings the charm. And authenticity. On draft, you’ll find Guinness, Smithwick's, Harp, and Magner's, all of which hail from Ireland, just like the brothers who own the joint (Tom and Garry Stack, from Cork County). 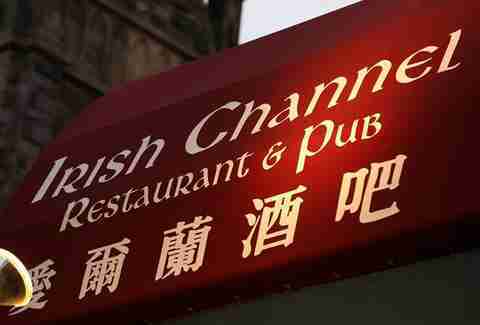 It has every Irish entrée you can think of: shepherd’s pie, fish & chips, Mullingar beef stew, and corned beef & cabbage, to name a few. This pub, named after the Irish architect of the White House, is a popular stop on bar crawls, and you can guarantee it's a sea of intoxicated green on St. Patrick’s Day. 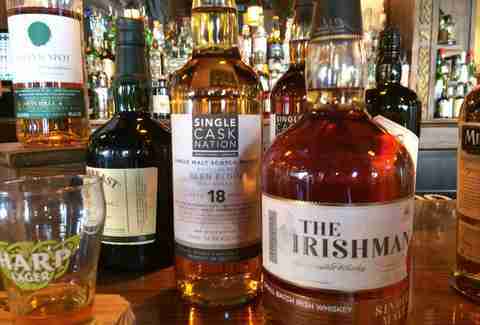 Drink wise, and you can work your way down a list of about 30 Irish whiskeys, mostly from Bushmills, Jameson, or Tullamore. Or, attack the $10 "Irish Classics" beer flight. 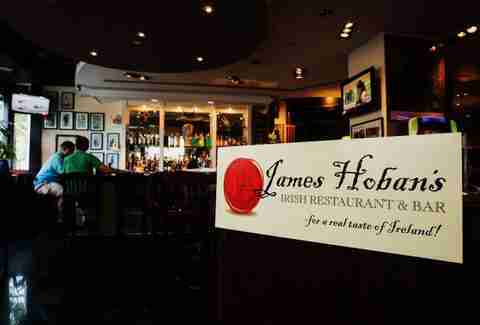 James Hoban's wins points for offering a full Irish breakfast for dinner -- but loses a couple for putting Guinness in its brownie recipe. Laura Hayes is a DC-based food, drink, and travel writer who also contributes to Washington City Paper, Food Network, Arlington Magazine, and others. Follow her on Twitter: @BTMenu.